Electric Warriors #3 is out 1/16/2019. 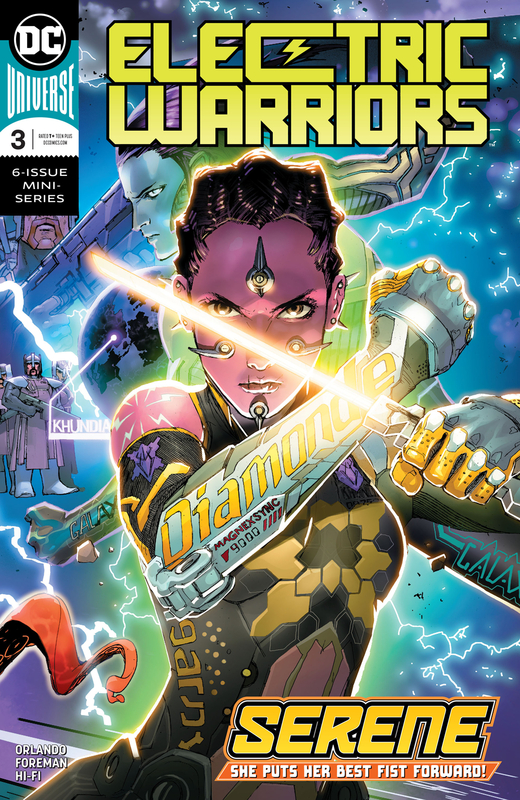 By Zack Quaintance — Electric Warriors #3 is a surprising comic, which is entirely in keeping with how this book has been since its start. I found it to be somewhat of a surprise when it was announced by DC just prior to this year’s San Diego Comic Con. With the publisher in recent years mostly playing it safe with series (aside from the ill-fated New Age of Heroes line, which it pretty clearly got cold feet over before it even launched). Electric Warriors, however, was an original idea set in an under-utilized era of DC continuity—Earth post Jack Kirby’s Great Disaster but pre Legion of Superheroes. So, yes, I was surprised from the moment this book came into existence. I was not, however, surprised at the excellent story writer Steve Orlando and artist Travel Foreman started telling. There was rich commentary about Earth and its divisive ways, a compelling familial imposter sub-plot, and all kinds of nods to obscure characters, alien races, and concepts from old DC Comics. The plot trajectory seemed pretty straight forward: the two champions of Earth would come apart before coming together and realizing it’s all one planet and as such we should all be one people (thereby making an excellent statement about the current divisive politics sweeping the planet and fueling the rise of authoritarian governments). In Electric Warriors #3 the trajectory I had envisioned changed. A lot. I won’t go into spoiler territory, but just know that this book is probably not what you first expected it to be. It may still arrive at the lesson I mentioned above (in fact, I for one am betting on it), but it seems to be taking a wholly unexpected (and delightfully more complex) path to get there, one filled with suspense and surprises. Indeed, at the halfway point for this six-issue mini-series a picture has emerged of a tight and clean narrative with a lot to offer both casual and long-time DC Comics readers. Orlando is really at his best here, equal parts brutal in the action and thoughtful with the characters and twists. Travel Foreman, of course, is an other-worldly imaginative talent clearly reveling in the freedom being afforded to him by playing in an obscure Big 2 timeline and era. I don’t think I’ve heard nearly enough chatter about this book, but it really is something special...and refreshing, an original concept from a Big 2 publisher, filled with new characters who can change, and learn, and grow, and ultimately die. It’s not too late to jump onto this train. At the very least though, I highly recommend making a mental note right now to catch up on this book in trade. Here’s hoping it factors into (or, even better, helps pave the way) toward whatever Brian Michael Bendis is currently gearing up to do with the Legion of Superheroes.